We have good news for all the Koffee With Karan fans out there. The sixth season of Karan Johar's popular chat show went on floors on Wednesday and can you guess who were the first celebrities to shoot for this season? Well, it was none other than father-daughter duo Saif Ali Khan and Sara Ali Khan, who is all set to make her Bollywood debut with Abhishek Kapoor's Kedarnath this year. We got a sneak peek into the sets of the show through Karan Johar's Instagram profile, who shared a picture of Saif and Sara and wrote: "Today was day 1 for the shoot of Koffee With Karan! Shot with the extremely hilarious and supremely bright and sensitive father-daughter duo!" Sara, who seemed all excited about her debut on the show, poached KJo's post after a few minutes and shared it with a different caption. She wrote: "Thank you for my first cup of koffeeee." She accompanied the post along with hashtags such as "#fatherdaughter" "#suchfun" #seeyousoon." 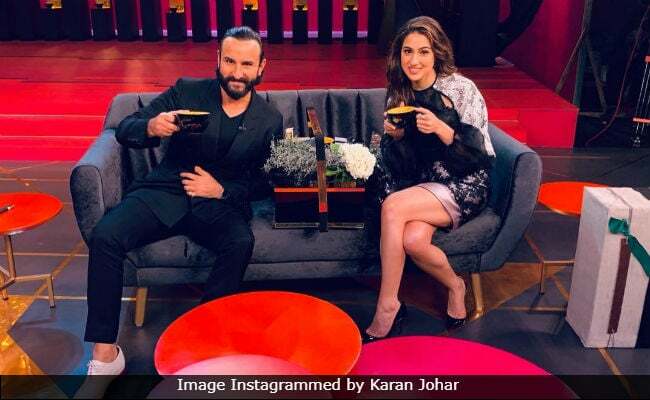 Meanwhile, Dharma Productions' official Instagram account also shared a picture from the sets of Koffee With Karan along with the caption: "Lights, camera....Koffee! Shooting for season 6 begins today! Which pair do you wish to see on the couch this season? Send your suggestions in the comments below?" It will be interesting to see the kind of questions that the celebrities will be asked this season. Remember how Karan Johar promised to ask all the "wrong questions" in this season's promo of Koffee With Karan and said "I'll admit to asking all the wrong questions if you admit to loving the answers." Apart from Sara Ali Khan, this season's guest line-up includes several new faces such as Janhvi Kapoor, Sunny Leone and Ishaan Khatter among others. The last season of Koffee With Karan was attended by several Bollywood celebrities, comprising Katrina Kaif (who made her debut on the show), Shah Rukh Khan, Priyanka Chopra, Anushka Sharma and Salman Khan and Aamir Khan among others.